3. The majority of cave systems and Mineshafts actually come to an end eventually, and appear less often. Seemingly endless caves should be a nice find. 4. We do not want chewed up and spit out eyesore terrain spammed all over the place - we want it to appear randomly and spaced apart to please players who like the wild terrain generations and the ones who like the flat lands for building. As soon as Mojang can get around to it! The videos for this thread were removed without my knowledge. I did not remove them myself so I can only assume that it was a member of this forums' staff. Some of the paragraphs below might not make sense because of the lack of the videos, and for that I do apologize and hope that the point I am trying to get across here is not any less clear to you because of this poor excuse of moderation that has taken place. Think of a Minecraft where you share seeds, not for finding cool villages, or for never ending ravines, or the overabundance of abandoned mineshafts (which are more common then one may think), but for finding marvelous mountain ranges, breath-taking oceans of hills and beautful springs and waterfalls, gigantic overhangs over looking fields of flowers, and floating islands surrounding a valley of jungles. This may all seem drastic: but very possible. Before for the 1.8 update of Minecraft - the terrain generation was wild, unpredictable, and exciting to explore. Ever since 1.8, the amazing and breathtaking land features have just vanished altogether. You do not have to take my word for it as this is a very wide and fast growing issue amongst all Minecraft players and the issue is gaining support quickly. More to the point, seeds are now useless because ever since the 1.8 update - Minecraft maps are all exaclty the same! There's no diversity, no variety in land formations; it's all similar. What is the point in sharing seeds when every seed is basically the same map?! Again, I know this may seem over exaggerated, but just compare these two videos to one another - and then try to tell me there's not a difference? Now take a look at this video of the top 8 seeds of 1.2.4 and 1.2.5 and tell me how the terrain on these two even compare to pre 1.8? Sure the jungles, ravines, villages, mineshafts are neat an all, but I remember when seeds were shared not because "I spawned next to an NPC village" but because "I spawned on top of a 200 block tall mountain surrounded by small islands of gravel". Seeds were shared for landscape rather then structure generation. You will even notice a clip in this video titled "This seed has weird looking mountains and a jungle" and just look at those mountains compared to some of the ones in the first video, and then try to tell me the seeds haven't changed? Sure there are some interesting land formations in this one, (well in seeds 1 and 2 at least) but look at the rest of the surrounding land. How's it look? Flat? Plain? ordinary? Dull? .. Yup! Why can't we have pre 1.8 map generation style implemented into modern Minecraft. Why can't we have a more diverse, wild, and unpredictable land generation in Minecraft? So I challenge you, Minecrafters, to prove me wrong. Show me images videos of some wild, diverse, and unpredictable land masses in Minecraft. Show me that I am wrong. I challenge you to prove to me that the Minecraft terrain generation has changed for the better. You may say "It's more realistic" but how often do you find yourself exploring "realistic landscapes"? There's no fun in it anymore when the best you have to find lies in that one seed on that one video on youtube. Do you find yourself often getting bored and actually wanting to go mining? How often before 1.8 did you ever want to go mining? My money's on almost never, am I correct? With the new terrain, sure you may be able to build a simple house, but you will never have the opprotunity to watch the sunset on a massive cliff over hanging a giant ocean with small islands surrounding you again. Unless you stand up and do something. Every voice makes a difference and if we all speak loud enough eventually Mojang will hear. If all of Minecraft would stand up and say "We want a diverse terrain generation" Mojang will hear. Don't be afraid to speak your mind, everone may call you a nostalgic, they may tell you it hasn't changed, but anyone who was around before 1.8 could tell you easily that the maps just aren't the same anymore. If you disagree, think about it again, If you still disagree, think about it one more time. You are not nostalgic, you just want a newer, diverse and wild terrain. You want variety in your biomes, and that's nothing to be ashamed of! This is something I am very passionate about as exploring used to be my number one thing I loved to do in Minecraft until 1.8. Until recently, I thought I was the only one who thought the terrain was dull and repetitive. That was until I found a movement on the MCF of players who are in the same boat as I. I am not alone in this, and neither are any of you. Together, if we all speak up, we can make a difference. We can give seeds a reason to be sought out. We can give players exciting and fun places to visit not just "Hey, you can spawn on top of an NPC village" that gives you a whole 5 seconds of "oh, cool" then what? More mining? For those picky and irritable minecrafters : This thread isn't asking for a total dramatic change and complete re-installation of pre-1.7 terrain gen.. just at least some tweaks to make the current terrain generation wild and diverse.. at least a few random mountains and amazing land structures to come across.. not a COMPLETE change, just some minor tweaks is all we ask. Let's not forget the over abundance of ocean. On a map I was exploring today I literally flew 50,000 blocks over nothing but pure ocean. God strike me dead if I am lying. It is ridiculous the amount of ocean in the map generation these days. We don't want realistic oceans, just like we don't want realistic flat land. Fix this, Mojang, please! 1.8 has turned almost every cave into a massive and endless underground swiss-cheese complex. Yes, they are really awesome to explore, but I miss exploring FOR caves. Now it's like once you find a cave, you're set for life. It's like the terrain was focused on forcefully expanding the underground world. Seeds are now also useless in determining cave sizes. In 1.7 and before, we'd get small, medium, large, and seemingly endless caves. Now we're forced to explore caves in only one size -- seemingly endless. Every small hole you find turns into 2 caves, which turns into 4 caves, and then there's entrances off in every direction and it gets damn annoying. Honestly... I saw this thread and couldn't believe it! I love the new biomes! They are pretty cool though not much to explore but I'm ok with that. Then I opened that Remember Before 1.8 Seeds... Honestly I almost cried! I remember all those great seeds and they put the new ones to shame...*sheds tear of sadness* I'm a believer! Praise the lord! By the way, don't forget to repost this please! More people need to see this! You have gone into depth what the problem is and how to fix it! In 1.8 and later, the seed generates the BIOMES first, and then uses a chunk of code to determine terrain for that specific biome. Since the code is the same every time it generates it, it results in every biome, and therefore every seed, looking almost exactly the same. The seed should generate the terrain first. Totally regardless of biome. Then, there should be a chunk of code that looks at the terrain and generates biomes according to terrain - as opposed to terrain according to biome. After all, there are only so many biomes, but the terrain combinations are endless. 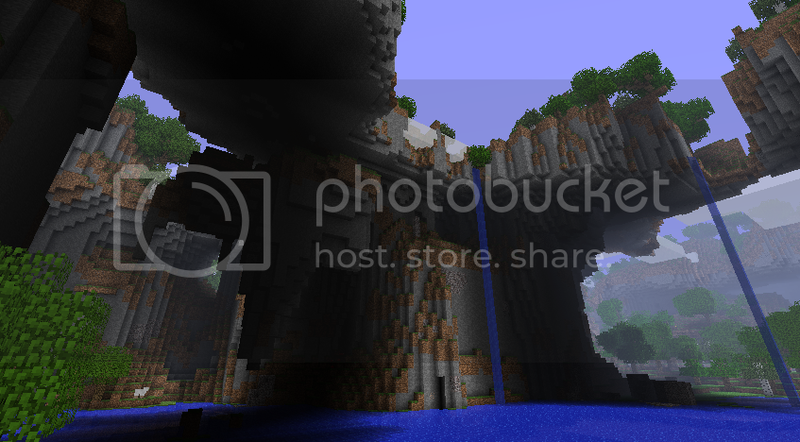 The seed should generate terrain and caves. Random height variation with only a very small amount of predetermined things, e.g. large height variation and some flatter spots. Also, for large areas below sea level, generate flat spots around that area. Extreme hills and mountain biome is chosen when there are very large terrain height fluctuation above sea level. When large flat spots are found, generate either a plains biome or desert biome. In the case that it generates a desert biome, replace dirt with sand and the first layers of stone with sandstone. If large areas below sea level are found, ocean biomes are made and the area around it is turned into either sand, gravel, or stone (new beach). For slightly hilly areas, either leave it be (generate lots of flowers) or generate trees on it for a forest biome. Then, after that, generate mushroom islands, villages, dungeons, pyramids, and ravines. Ok, that was off the top of my head. 1:one reason I don't like the new generator is because of th caves. It's like mojang built minecraft assuming you'd spend 95% of ur time under ground! 2:why I hate the new seeds is u can spend an hour typing in numbers, and have no Luck on a place yo build ur house. And once I did just that.3:I've been hiking a lot, and and I've seen from deserts in Arizona to waterfalls in California. There was a lot of verity. Theres none of that in the new genrator4: intoo, nearly cried when compared the two seed videos! I cannot agree more. I loved the generation of wild landscape in previous versions. You even got me totally at the "wanting to go mining" part. I used to enjoy walking around and risk having to build emergency shelters at nightfall just to try to see as much landscape in a world as I could, and now I can even expand bases outward at 5 blocks per day until I have a small village and feel no urge to go any further out. Everything since the Adventure Update has made the game much more complicated and interesting, but I believe other aspects of the game are to be preserved as well. So yes, add me to the supporter list if you will please. For some time now my friends have been giving up minecraft saying "It's not the same anymore, we've run out of things to do." and i believe this is a very pivotal reason. The lack of changing terrain has lead to monotonous builds and has given minecraft what i had for so long believed was impossible: A norm. With terrain generation remaining the same on nearly every map, it gives a rather 'stale' quality to a game which is supposed to be completely open ended with infinite possibilities, both with what you do and with what the world gives you. The same set of biomes can only be played differently so many times and although the "realistic" terrain generation was wonderful around the time it was new (1.8+), it's proven to be cumbersome rather than enjoyable. Before 1.8, terrain was ALWAYS different and unexpected, finding a cool mountain wasn't a regular thing, so it was nice to be able to build a huge fort into it. Now, extreme hills biomes are nearly uniform and offer no interesting or exciting features with which to entice the player other than height. I hope this gains ground and this is the only movement i've agreed with enough to read through, nonetheless post in. This thread is a total win. It could not be more true and elaborate. Our old terrain generation brought wonder before our eyes. We scavenged all we could and took every cave we could find. Now we are overloaded with caves, mineshafts, and ravines. It's terrible. Minecraft used to be place full of life. Full of adventure. You could live under an overhang like a troll or carve yourself into one of the many floating islands for the best view. You could make a minecart roller coaster head through an entire canyon and over the skies. The generation made many shapes from arches to tops. It just isn't like that anymore. Now we have boring flat planes and boring endless oceans. You can't live in the dream land anymore. It's all too realistic now, with plain old hills and stupid little mountains and ravines. Since when is minecraft realistic? We have creepers and magical dust. Minecraft is not realistic. Let it not be." Could also fix this issue by introducing new biomes. Want to support us and help spread the word? Just add one of these into your signature! We'd like to thank one of our supporters, Mobyguy77, for the awesome banner he made for us! People often imply that if the height variation we're talking about would return, there'd be no room to build. Despite it being fairly easy to build on the previous generator, and that you were sometimes forced to terraform (a challenge in the game that's not present anymore) giving you resources while you made land suitable for building, the mass amounts of flat land found in 1.8 would NOT disappear. Variation means that the terrain has the chance to be A, B, C, X, Y, Z, etc. When we say height variation, we do not mean "spam every region with mountains." However, if height variation does return, having an area or multiple areas within a seed or multiple seeds that is spammed with mountains will be extremely possible, but so will be the chance of finding mass amounts of flat land, or hilly land (or mixed!) under the same circumstances. I don't see why some people are disagreeing with this. It will NOT REMOVE flat land, but it will give every area in every seed the chance to be something unique. Why not just use mods? Why do we not use mods? Actually, your title is misleading and erroneous. What you should have said is "I don't like the terrain generator, and here is why." Seeds are far from useless because they let player use seeds other players have found that are interesting for some reason or that they used in the past that they like. I'm also pretty sure you are wrong that seeds are only shared because of "structure generation", but hey, you want a nostalgia trip, so I'll just leave it at that. Just waiting for Forge to officially release for 1.13.x to remove unneeded mobs from 1.13, like Phantoms, from the game because, in my gameplay based opinion, they add nothing of value to the game. Fun fact: Clicking a bed every 30 minutes doesn't make you a better player, it makes you one who clicks a bed every 30 minutes. Wouldn't you rather just mod them out of the game completely? So I'm guessing you didn't read the thread all the way through? And as I said - feel free to prove me wrong with pictures, images, whatever it may be and yet you reply with your opinionated post while at the same time failing to present any evidence to prove your cause. why is that? 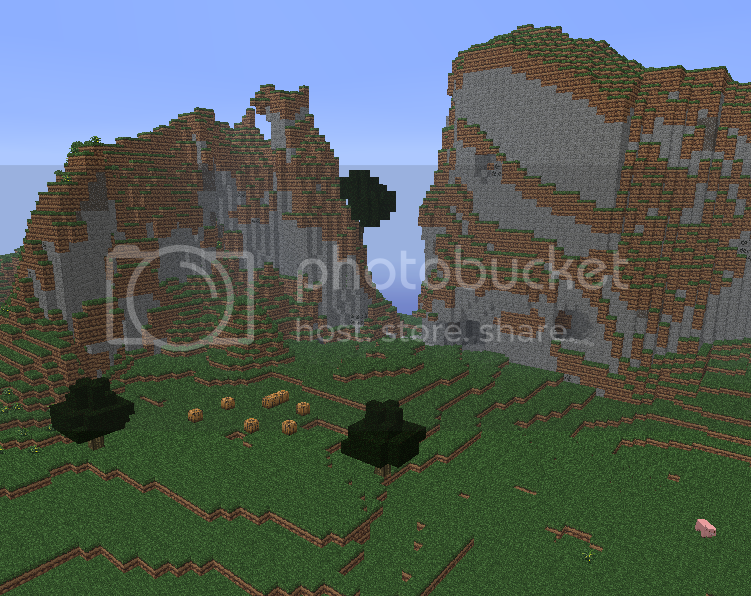 Seeds are shared: they do provide players with the ability to share a neat map they found with one another but 9 out of 10 times since 1.8 a seed is shared for biomes, structures, or some other pointless reason. It's never for the land structures like it was before 1.8. This isn't a nostalgic thing this is a wanting a new, diverse, and wilder terrain generator with 1.2.5. Before creating your pointless posts, try reading the original post. And the reason seeds would be considered pointless is because every map in minecraft today is pretty much the exact same thing. They are repetitive, dull, flat, boring. It's the same nonsense no matter what kind of map you load and therefore: seeds are pointless. millions of different seeds: same map. Seems drastic but: read the original post. More biomes eg. Meadows of flowers and tall grass with bright green grass, cliff/ beach biome like in the gargamel seed, beaches on its own, Forest mountains and some more. There should, as you said be a more diverse landscape where mountains have great overhangs and All the other biomes don't look exactly the same for example, desert and plains, no matter the seed you go on, they all look the same. I agree 100% a couple of new biomes would be nice - but not too much as I wouldn't want them to over do it. As for the ores, I personally feel they are a little over abundant. Iron, coal, and gold specifically are a little too common for my liking. Or maybe it's just that they've always been like this and no one's really noticed until the 1.8 update as after that update everyone started mining because exploring was no longer a possibility... Well I suppose it is a possibility, just a very boring and dull one. Yup! This is the problem it seems that ever since 1.8 and later the cave systems are just over abundant and endless. It no longer feels rewarding to stumble upon a cave ... and to be quite frank I kind of miss the feeling of being disappointed when I find a dead end cave after searching for fifteen minutes! I know that sounds silly, but that's just one of the many things that used to make Minecraft.. Minecraft. That's why I felt the need to create this thread. Thank you for your support! Exactly. With the new terrain it is easy to build homes almost anywhere, but what fun is building a home when you can't even watch the sunset between two mountainous terrains off in the distance across a vast wide open ocean? Well I happened to get a pretty good seed, but it took forever to get it. And I never really leave the area because the land around is it is just plain platitudinous. I remember the good old days where every day I couldn't wait to go see what was behind what I had yet to explore. As would I, post please? I wonder if just typing makes a signature? i agree with you! though ive never played the beta versions, ive seen viedos, some realy cool things! now the most interesting world gen thing ive seen is a ravine and a few floating sandblocks! and sometimes a find a cool seed and try to use it and it doesnt work or i enjoy for 5 seconds then get bored. bring back the old world generator!!!!!!!!!!!!!!! I'm pretty sure that you will not spawn right by those coords like I did. I will try to post some pics. The videos both provide some pretty accurate pictures you may want to check those out. Thank you I'll be sure to go check it out! make a signature for this so we can spread the word! I'll start working on one now and send you a private message to come check it out!